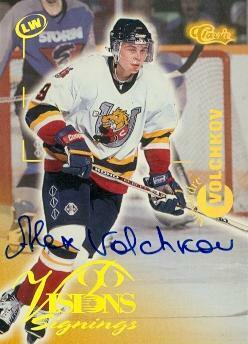 The First Ever NHL Drafted Colt - Alexander Volchkov. #OHL #NHL - Very Barrie Colts | A website covering the Barrie Colts of the OHL. Wow, 1996 - Grunge music was at an all time high, Independence Day hit theaters, and the original PlayStation was in its infancy. Does anyone remember the first ever Colt drafted to the NHL? You may not, he was a 4th overall draft pick in 1996, to the Washington Capitals. I will forgive you this time, but it was Alexander Volchkov.... who you may ask? That's a fair question, he only actually played in 3 NHL games ever. Recording exactly 0 Points - not even a sneaky hook for 2 minutes in the box. nothing. He was a very highly touted player at the time, in 103 career Colts games over the 95/96 and 96/97 he was over a point per game guy, 146 in total. Volchkov also found the net 66 times. Solid numbers for sure. Ultimately, the second Colt taken in that first draft, Jan Bulis, had a solid 10 year career in the NHL. In the previous 5 drafts going back to 1990 and ahead the next 5 drafts till 2001, every player that was taken in the top 5 played at least 70 games in the show. And while he did have a solid pro career bouncing between the AHL, IHL and Russia, he was ultimately out of the pro game by the age of 23.